Lexus face-lifts GS range | What Car? 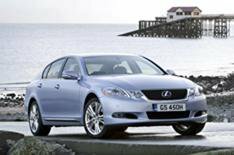 Lexus has given its GS executive car a face-lift, and has also added a new model to the range. The biggest change is the addition of the new GS460, which replaces the GS430. The GS460 has a new 342bhp 4.6-litre V8 petrol engine, which is matched to an eight-speed automatic transmission. The powertrain means the car can accelerate from 0-62mph in 5.8sec and go on to a limited top speed of 155mph. Fuel consumption is 25.7mpg and carbon dioxide emissions are 258g/km, putting it in the highest tax band. GS460 cars have a 14-speaker Mark Levinson stereo, satellite-navigation, Bluetooth phone system and a six-DVD autochanger. The GS now has subtly restyled front and rear bumpers, a chrome surround for the grille, new door mirrors with integrated indicators, and new door handles. There are also new 17-inch alloy wheels for the GS300 and GS300 SE, and new 18-inch wheels for the GS300 SE-L and GS460. In the cabin, GS460, GS450h and SE-L models have upgraded leather upholstery, and all cars have an input jack for connecting iPods to the car's stereo. To improve the GS's driving characteristics and improve efficiency, all models also have retuned shock absorbers and springs, and revised underbody aerodynamics.